I have this opinion that even a vegetable garden should be a thing of beauty. I know, you all think I'm nuts on this one. But I do feel this way, and we have developed our vegetable garden with beauty in mind. And maybe you don't find it to be beautiful, but that's okay, because I do. 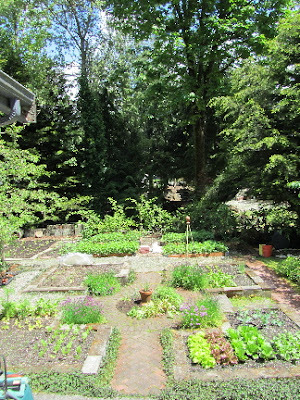 The main body of our garden is set on a square. There are four raised beds, one in each corner. I don't know if this photo illustrates the shape of each bed, but they are basically L-shaped. The area for our garden is on a slope, which presented something of a challenge for raised beds. We chose concrete blocks to build the beds. It was a lot like using Legos on a large scale. We liked this option because they're heavy and wouldn't shift much, they were manageable enough for us to install the beds ourselves, were fairly inexpensive, and gave us level gardening areas, despite the slope. The blocks are topped with rectangular, concrete garden pavers. While I don't know the actual figures on how much we spent to build these beds, the concrete blocks were a little over a dollar a piece. And the paver tops were under a dollar each. To build a raised bed of concrete blocks yourself, begin with your dimensions. Concrete blocks are roughly 16 inches long by 8 inches tall, and either 6 inches wide or 8 inches wide. (We went with the 8 inch wide block, less likely to tip over, we felt.) After you've determined the size and shape of your bed, lay down about 2 inches of crushed rock, where the concrete blocks will sit. Level and compact this rock as best you can. (My husband made a contraption from a piece of plywood nailed to a piece of post, and he tamped down the rock and sand with this.) Lay an inch of sand over the crushed rock, to use as a base for the blocks. After placing your blocks, you can top them with pavers, as we did, or fill the holes of the blocks with soil and plant a ground-hugging herb like prostrate rosemary or creeping thyme. We chose to do pavers, as they give me a ledge to sit on while working in the garden, or just hanging out visiting with my plants. 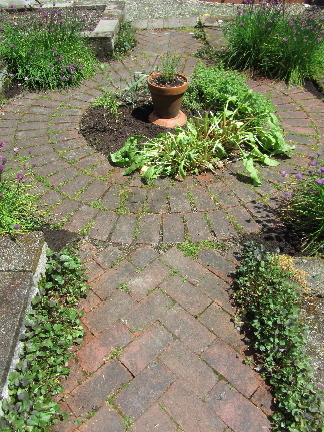 my herb circle surrounded by a brick walkway. In the center of the four beds is an herb circle. It looks pretty motley right now, but as the season progresses, it'll improve. In my herb circle I have thyme, sorrel oregano, tarragon, watercress and garlic. In the corner pockets, between the L-shaped vegetable beds and the herb circle, are chives. I also keep rosemary and basil in pots on the deck. (Our maritime northwest climate leaves us with cooler summers, and the rosemary and basil just do better up against the house, in pots.) In the vegetable beds of the garden I have the annual herbs (dill, parsley, cilantro, shallots). I especially like growing culinary herbs. They're both beautiful and useful. Later in the season I'll make herb vinegars, relishes, salsas, pickles and chutneys, using some of the herbs. They provide us with a lovely taste of summer when the weather is anything but lovely in fall and winter. Herb vinegar makes a nice gift. And the cost is mostly in the bottle itself. White vinegar is cheap if bought by the gallon. And if you're growing your own herbs, there's no cost there. Wash herbs (thyme and rosemary are a nice combination). Pat herbs dry with a paper towel or tea towel (something non-linty). Push herbs into the bottle, using a chopstick to get them all the way in, as needed. Fill bottle to 1/2-inch of the top with white vinegar. Allow to sit for 1-2 months. It'll only improve in flavor as it sits. Herb vinegar makes a very nice vinaigrette, with some oil, salt and a bit of garlic. Perfect for a simple salad of garden greens. Our garden is still a work in progress. But I'm hoping I have a long, long time to complete it. That is beautiful! I am definitely going to try to make the rosemary vinegar this year. 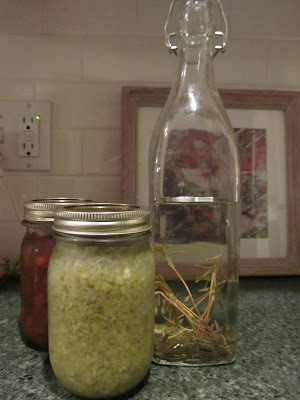 The vinegar was so incredibly easy to make. I've been using this bottle all winter. I add it to cole slaw dressing as well as vinaigrette. I'm going to do a thyme vinegar as well as the rosemary this year. I've saved a couple of interesting olive oil bottles. I'll use corks for nicer caps than the screw on ones. What herbs are you growing this year? An absolutely beautiful looking garden! A real inspiration! Thank you, but you haven't seen the rest of the yard. Needs a whole lotta work! Do you enjoy gardening?